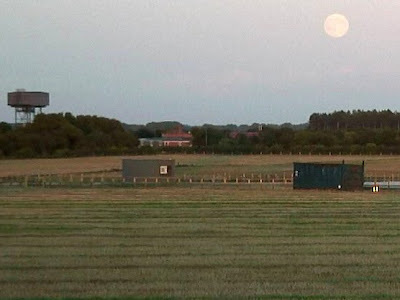 On the evening of the 24th August 2010, one of the site security cameras caught this photograph of the moon rising over the LOFAR field. There seem to be three containers in the photograph. The raised one on the left is an WWII ex-RAF water tower. The middle one, with the white box on the side of it, is the RF-container. This is where the bulk of the LOFAR signal processing occurs. The white box is the air-conditioning unit. The battered-looking container on the right is the construction skip, where the surplus and waste materials are temporarily stored.